Crossing Worlds Hopi Projects in support of Hopi and other northern Arizona traditional cultures and cross-cultural education: service projects, articles, photos, ways to get involved. Mission: Crossing Worlds Hopi Projects supports Hopi sustainability and self-empowerment and provides cross-cultural learning opportunities for all peoples. Hopis continue an ancient tradition that values hard work, respect for life, humility, prayer, cooperation, sharing. A devout and kind-hearted People, giving and sharing are core values. They face economic challenges of living on a remote Indian reservation far from the resources of urban America. Our support is from a place of respect and thanks acknowledging the challenges of living on an Indian reservation in remote Northeastern Arizona far from the economic resources of urban America. Hopi winter gifting project to provide food and needed household and clothing items in winter when most needed. All gifting is from a place of respect and thanks acknowledging that Hopi people are carrying on a tradition that is of importance to all the world. For more information. Provide support for Hopi home repair projects with special focus on addressing health and safety concerns. We provide funds for supplies and to pay Hopi contractors. The recipient families provide volunteer labor. Support for orchard/garden installations at Hopi in providing more of their own fresh food by planting orchards, berry vines, herbs and kitchen gardens with low water drip systems, mulching, contouring and other water saving permaculture garden techniques. Support for Hopi school children with learning and sports supplies plus some youth also need clothing, winter coats, and beds. Provide support and coordination to bring Hopi people to share about life today, cultural information, arts, social dances with the interested public to provide a living connection to the descendants of the people who inhabited this valley for so many millennia. Provide support for Hopi youth/adult learning in coordination with the Verde Valley Archaeology Center and other resources in the Flagstaff/Verde Valley area. Service Projects at Hopi: Provide the opportunity for schools and other off-reservation groups to perform a designated village service project in combination with a Hopi cultural learning seminar, such as 2003 California Waldorf high school group which helped buy supplies and build an outdoor bread oven. Our goal is to provide some project coordination, Hopi expertise, and planning and for viable, qualified volunteer groups. Native peoples benefit by receiving help with needed infrastructure and respect and interest from the outside world. The village project leader and cultural instructors receive employment. Visitors gain by experiencing first-hand the enrichment that comes from being part of the the community and making a needed contribution. Provide support for Hopi ceremonial activities throughout the year such as helping with needed supplies. See Hopi Cycle of the Year. 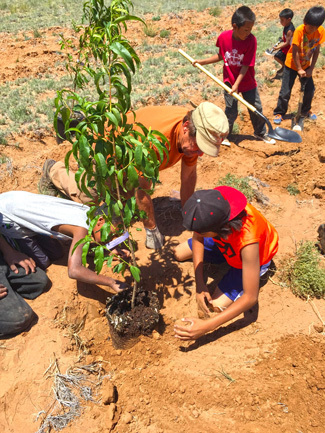 Provide support for local Hopi groups that are working hard toward greater sustainability in the food system and expansion of Hopi farming, and for other groups working with local empowered to improve housing and economic opportunity. We accept donations in support of our Hopi projects. Our office costs, labor and gas are donated by our dedicated volunteers. a 501c3 Arizona non profit corporation based in Sedona, AZ. with Crossing Worlds Hopi Projects in memo field. Future Program Goals: In these times of change, we are all learning from each other as we come together in circles of friendship and respect. Offer seminars which employ local Native people to share in a natural, experiential way cultural values, life ways and wisdom, creative expression (e.g. arts, storytelling, music) on Hopi and Navajo lands and other locations for individuals, families, groups. Coordinate authentic Continuing Education experiences taught by Hopis on Hopi land for teachers, social workers, health care providers and other interested people. We have seen that over the years that many of these professional care providers also gain fresh inspiration to take back into their work and personal lives. Photos on Home Page are by Sandra Cosentino, except historic images, and 5 by Jackie Klieger including Jackie's wonderful sisters photo at top of page. We appreciate Jackie sharing her professional expertise with us for the past several years! In support of Hopi sustainability and self-empowerment; and cross-cultural learning opportunities for all peoples. 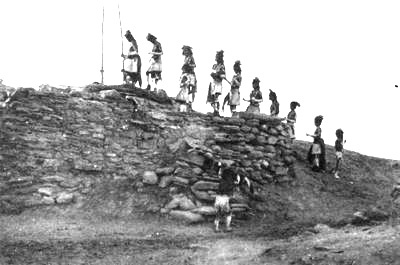 1910 -Endurance, faith and hard work — hallmarks of Hopi. Northern Arizona is the home of the Hopi Nation. They chose this remote, high desert land 1,000 – 2,000 years ago, after thousands of years of migration around the Americas. Hopi are descendants of the Puebloan Ancestors of the Colorado Plateau-Verde Valley region going back at least 12,000 years. They continue an ancient tradition that values hard work, respect for life, humility, prayer, cooperation, sharing. They honor life from the birth to the transition of a person into the realm of the ancestors. Every day begins by welcoming Dawa, the Sun, and by giving thanks for life. Hopi people’s prayers and ceremonies are for all peoples and to help maintain balance on Mother Earth. A devout and kind-hearted People, giving and sharing are core values. The Hopis manage to grow corn in the desert without irrigation. Corn is life and proof of their faith, endurance and prayers. In today’s world, Hopi people work to teach the children Hopi language and values. They face economic challenges of living on a remote Indian reservation far from the resources of urban America. 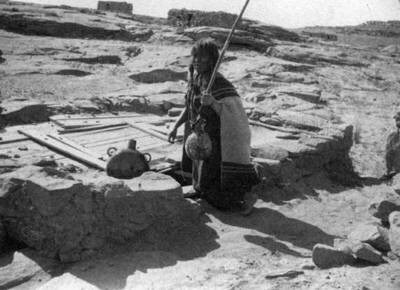 Pictured - 1910 hauling water from a cistern. The only water before modern wells was from springs and cisterns. We purchased 3 pieces of playground equipment for each of the 4 Hopi pre-school playgrounds in 2014. Hopi Holiday Project, 2015, unloading and sorting food at First Mesa. A future goal is to coordinate authentic, personalized experiential learning seminars on Hopi or Navajo lands led by Native hosts for professionals (continuing education) and other interested people. 2015-16 home renovation and addition project to add on a kitchen and shower room to an historic 1-room home, handicap ramp and alternative water system in a village with no sewer or water to the homes. on top of 1st Mesa, 2009. Support and coordination to bring Hopi people to share about life today, cultural information, arts, social dances. 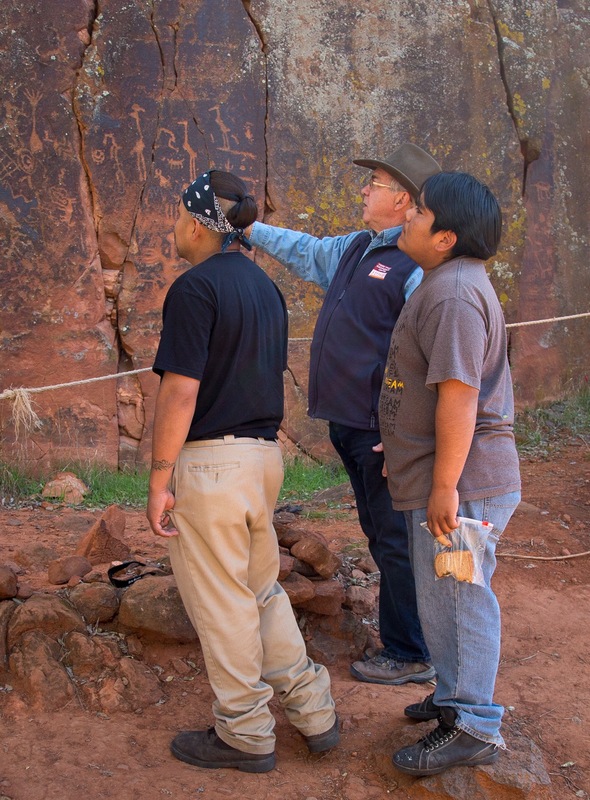 Crossing Worlds Hopi Projects sponsored bringing Hopi youth and adults to the Verde Valley to learn about their ancestral sites in field trips led by Ken Zoll of the Verde Valley Archaeology Center. October, 2015. Support for orchard/garden installations at Hopi in providing more of their own fresh food by planting orchards, berry vines, herbs and kitchen gardens with low water drips systems, mulching, contouring and other water saving permaculture natural garden techniques. A native of this land from an Arizona pioneer family, she draws on a lifetime's experience of exploring the Southwest , listening to Nature and sharing friendship and respect with indigenous Peoples. Creator, owner and head guide for Crossing Worlds Journeys, Sandra, M.S., has been offering quality experiences of the Southwest since 1991. Prior to that she was a school teacher, natural resource manager, forest service fire look-out and worked professionally for and with Native American groups. 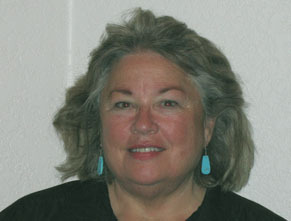 Deborah holds a deep respect for the Hopi people and has been a dedicated volunteer and supporter of Crossing Worlds Hopi Projects since 2003. Deborah owns Sedona Sky, LLC a Web Design, Web Hosting and Virtual Tour company serving the Sedona area since 2003. She is also a Licensed Massage Therapist practicing since 1989 and owner/operator of Ancient Sea Spa Services.